Inspired Paintings Inspired Paintings Group 6 Will You Drink of This Cup? This cup of suffering came with the fall of mankind in the Garden of Eden (Gen. 3). Casting blame away from self and inventing escapes from its hard reality has been mankind’s normal reaction to the cup of suffering. Jesus Christ came to lift the cup of suffering. He gave thanks for the power to remove it and because it meant that never would we have to bear it alone. We learn to lift our cup of suffering unto Him and in Him we get to know the abundance, the fulfilled promises of God. 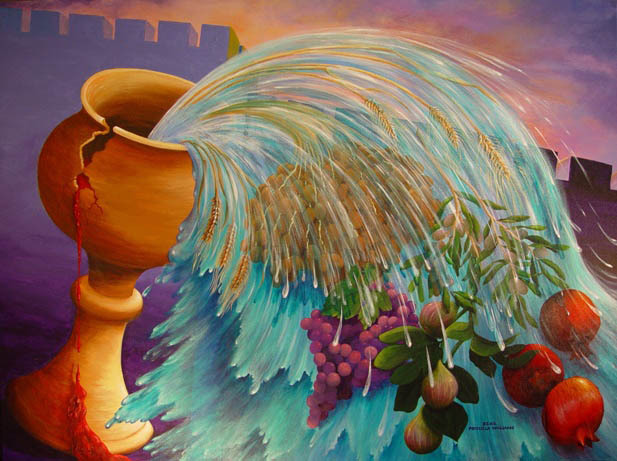 To lift our cup of suffering as Jesus did with thanksgiving, we acknowledge the sufficiency, the faithful goodness and sovereignty of our God, supreme over the present afflictions. We yield to God’s wisdom over our lives. (Romans 5:1-5) ………..And we rejoice in the hope of the glory of God. Not only so, because we know that suffering produces perseverance, perseverance, character; and character, hope. And hope does not disappoint us, because God has poured out His love into our hearts by the Holy Spirit, whom he has given us. We learn to see more than the cup of suffering. We learn to rejoice in and over and above the suffering and struggles because our God is the greater power to take us to the advanced levels of maturity, deeper relationships with self, Him and others. He is the redeeming power at work within us bringing us into His design for us….His fulfilled promises through us. The remnant, few are willing to lift this cup of suffering with that kind of far-reaching perspective. So few see such abundant fruit in their lives. It is a choice. The cup of suffering is unavoidable. It is how we respond to it that makes the difference, especially in such a time as this. The Jerusalem wall reminds me of my attempts to fortress myself away from the cup of suffering. Jesus there in the presence of the wall and the temptations to let the cup pass from Him vulnerably embraced this cup with thanksgiving. I am invited to follow Him for the same promised fruitfulness. There is only one thing in alignment with the viewer in this painting begging agreement. It is the stream of blood. It is, indeed, costly but so worth the price.